Cannot download software packages from patch source. Check the events and the Update Manager log for download details. At this point I think it is important to mention we predominantly use Hewlett Packard Enterprise (HPE) servers, both blade and traditional rack mount. You will see the URL in the status message relates to the HPE VIBs (vSphere Installation Bundles – see ‘What is in a VIB?’) depot. HPE provide repositories which can be added to VCUM to allow one to update HPE servers with the relevant drivers and ESXi updates specific to their hardware. Now you may or may no be aware of the fact Hewlett Packard recently went through a split – notice I have been calling them HPE or Hewlett Packard Enterprise. If you have been paying attention to the errors and screenshots you will have noticed the URL has the format of x.hp.com. Success! 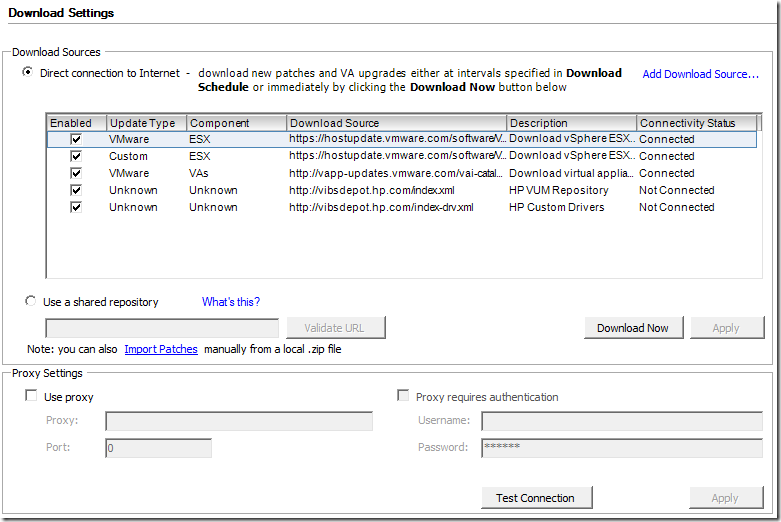 I did this for both of the download sources and they now show as ‘Connected’ and the ‘Update type’ and ‘Component’ fields correctly display as ‘Custom’ and ‘ESX’. It is important to remember to click the ‘Apply’ button to save the changes made, if you try and leave this window vCenter will prompt you to save your changes. Finally I tried to stage the patches to a host and this time we see they have been copied successfully and without error. It’s always nice when a problem turns out to be so easy to fix – a bit of common sense and knowledge of the worldly affairs of a supplier meant I fixed this in a matter of minutes. Hopefully if you have come across this problem the post will be helpful. As always if you have any thoughts or questions please drop a comment below.